It is without any doubt that plastics have been increasingly popular in material selection for plastic products and have found applications in engineering fields spanning from automotive to construction and from biomedicine to packaging of everyday healthcare products. The ease of processing, low cost of production and lightweight characteristics are just a few of the advantages of the plastics when compared to other materials like metals etc. The thermal, mechanical and physical properties of the plastics could vary significantly and can be tuned according to the application and the designing needs. This is because plastics are made of long chains of hydrocarbons which are arranged in different configurations (molecular structure). The size, the type of hydrocarbons along with the chain architecture (crystallinity) would ultimately define the basic properties of the plastics. For example, pure polypropylene (homopolymer PP), one of the most popular plastics, due to its high crystallinity shows very good tensile properties but yield relatively poor impact resistance. 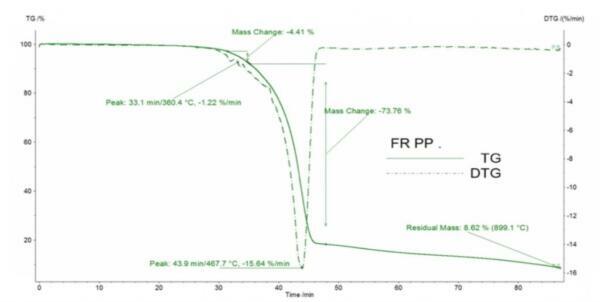 Polyethylene (PE) on the other hand shows exceptional impact resistance properties. Chemically mixing PE molecules in the PP formulation would result in a copolymer PP-PE, with a combined high tensile and impact performance. This material finds excellent use in automotive and plenty of other industries. Apart from their main characteristics, the ultimate material properties of the plastics could also be adjusted by the use of different types of additives. In fact, additives made of organic and/or inorganic materials are present in almost all the plastics. They are mainly used for colouring, provide protection from oxidation and UV radiation, improve processing (minimise friction during manufacturing) and for protection against fire. The finished plastic product is the outcome of compounding usually one or two different plastics along with different types and levels of additives depending on the application. As a result, it is becoming obvious that the characterisation of the plastic material and revealing all its components could become a rather complicated task. The origin of the additives which could be either organic, mineral, ceramic and or metal along with the use of more than one polymer are the main reason why a series of different characterisation techniques should be applied. The most common techniques used for revealing the identity of the finished plastic products are based on the thermal analysis and spectroscopy. Materials would behave differently when subjected to different temperatures. Also, due to their molecular structure and orientation, individual components and spectroscopic techniques use a range of principles to reveal the chemical composition, composition variation, crystal structure and photoelectric properties of materials. Below, we will be presenting two examples of how simple techniques could be applied in order to characterise the plastic materials and reveal their formulation. An automotive part manufacturer ordered a batch of moulded PP based plastic products from overseas and wanted to make sure the product had high impact PE in it. Thus, a full material analysis was performed including infrared spectroscopy. Every plastic holds its own characteristic fingerprint feedback (Spectrum) when scanned with infrared radiation. The method is called Fourier transformed infrared spectroscopy (FTIR). In this case, as shown in Figure 1 below, FTIR analysis showed the basic fingerprint of PP along with secondary traces of PE. These traces were evident at the 2840 cm-1 area at the infrared spectra (Figure 1). As result, through this simple test, it was revealed that the plastic is a high-impact PP, blended with PE molecules. Furthermore, a large construction company required the use of specific fire-resistant polypropylene materials used in cladding and wanted to check whether their material, provided by their supplier, met their requirements. For this reason, the specimens taken from the cladding panel were studied using the infrared spectroscopy coupled with a thermogravimetric analysis machine (TG-IR). In simple words, the part was subjected to high temperatures (TGA) up to 900 C and all the gases evolved from the decomposition were transferred into the FTIR unit via a special heated transfer line. 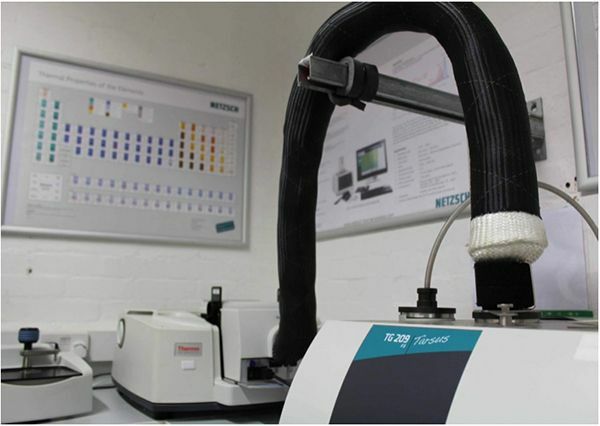 The TG-IR (polymer characterisation technique: TGA – FTIR) is a very powerful technique, it provides full qualitative and quantitative material analysis and it is often used for material qualification, additive identification, efficiency, reverse engineering, failure analysis, batch-to-batch variations and identification of harmful or regulated compounds. In our case, the TG thermogram of the plastic specimen shown two main weight losses, one at 33 min or at 360 °C and one at 44 min or 468 °C as shown in Figure 2 below. Analysis of the evolved gases at around 33 and 44 minutes via the FTIR revealed that the plastic part was mainly consisted of ammonia, phosphates and polypropylene. As a result, from the TG-IR test, we have concluded that the plastic cladding is made of PP material filled with ammonium polyphosphate additives to give fire protection. The level of ammonium polyphosphates in the mix was aprox. 4.5% per weight. In conclusion, herein we have demonstrated two simple methods based on thermal and infrared analysis to reveal the identity and chemical formulate of plastic products. We have showed how FTIR in solid state and coupled TGA-FTIR methods are able to help the plastic manufacturers and end product users understand what their parts are actually made of. With the increasing use of plastic in our daily life and with the plastics finding application in more demanding areas increases even more the need of strict quality control and assurance measures in order to produce safe, environmental friendly and efficient products. The strong background and knowledge in materials combined with the latest technology equipment, make impact solutions a leader in R&D of materials, as well as quality assurance and control. Should you have any further questions about our polymer characterisation techniques: TGA – FTIR (TG-IR) or any other tests do contact us at info@impact-solutions.co.uk.